Salutations! I am now 11 years old and am an ancient coin archaeologist destined for the stars. I am the Young Indiana Jones of numismatics! My adventures in the world of ancient numismatics began when my homeschool teacher, my mom, wanted to teach me some archaeology, ancient, history and research skills. She purchased a small hoard of dirty old coins from a coin dealer for me to work on and a book about Ancient Greek and Roman Coins by Zander Klawans. If I helped with the cleaning and research, mom would help me place my research on the internet to share with other ancient numismatic enthusiasts. Furthermore, I could also sell some of the ancient coins that I carefully excavate, research and attribute on the internet so that I can help pay for my special summer program that helps me with my Asperger's Syndrome. Asperger's Syndrome is a rare developmental disability that causes impairment in communications and social interaction as it is related to high functioning autism. Children like me with Asperger's Syndrome are frequently called little professors because we are also very intelligent and enthusiastic about learning and sharing our thoughts about things like ancient coins, history, robotics, computers and many other fun topics. Unfortunately, we little professors often have problems communicating with kids our age because our vocabulary and ideas are way too baffling for our peers. In fact, my best friend, who is 5 years older than me who is also an Asperger's kid with interests in computers and airplanes, calls me young Einstein. He says that I scare him every time I go off into areas like mathematics because he just can't keep up with me even though he is older and is as intelligent as I am. Not knowing who or what Einstein was, I researched him and found out that Einstein fits the profile for Asperger's Syndrome. Einstein had to be homeschooled like me when he was very young because he too had problems fitting in a regular school. Little Einstein was clumsy at sports, had a tendency to be ridiculed by children his age for being odd, had meltdowns when overwhelmed, and just could not handle learning like most school kids. He had so many problems getting a job when he was a young adult because of his disability. Einstein lived in poverty and near starvation even though his theory of Special Relativity, first published when he was 26 years old in 1905, and his famous E=mc^2 equation first published in 1907, profoundly changed the nature of physics. Einstein could only find a low paying clerical job at a patent office from 1902-1909 because no university would hire a bright, yet eccentric young man like Einstein until his theories gained such recognition that he could no longer be ignored. As a small child, Einstein did not do well learning by rote. Imagine if little Einstein had more hands-on learning tools like ancient coins to teach him subjects that he did not do well in. Einstein would have been able to receive numerous scholarships and gain more credentials as a young scholar and teacher rather than live on the brink of starvation if only his grades were higher. Imagine all the little Einsteins who grow-up too frustrated to pursue academics and afraid to share their fabulous thoughts. Then imagine a world without the internet, remote control television, computers, video games and many of the viewscreen electronic gadgets that we take for granted. Young Einstein's 1905 paper on the photoelectric effect, written and published the same year as his Special Relativity paper, eventually won him a Nobel Prize in physics in 1922. The photoelectric effect makes possible all the fabulous electronic devices which help us communicate via the internet, entertain and teach via the computer, detect and monitor life threatening illnesses, record and display human accomplishments and tragedy, and extend our curiosity into the deepest oceans on Earth and other planets. Ancient numismatics is a fun way to learn foreign alphabets, archaeology, ancient history, art styles, culture, research, patience and fabulous legends. In areas of chemistry and physics, you learn through hands-on experiments. In ancient numismatics, you learn to care about the past through patient and careful cleaning and conservation of ancient coins. You learn how to read secret codes in archaic alphabets and decipher truncated messages as if you were a real spy. You learn to appreciate art styles and historical events in order to attribute hard to identify coins. You learn to appreciate long lost cultures through the fabulous stories and legends illustrated on each coin. You learn to recognize the different qualities of metals and metal alloys. You hone sharp research skills as your passion to attribute scarcer, unpublished coins deepens and you find out that the little Klawans paperback book that mom bought you is simply not enough! Most of all, you develop friendships with fellow numismatists who enjoy sharing with little Einsteins like me and deepen my appreciation for the past as much as my enthusiasm for futuristic robotics and space travel. Perhaps, one day when I am a grown-up astronaut, I will bring my own little hoard of coins on a trip to another planet and bury the coins as would a Roman soldier. Then in the distant future, someone or some kind of intelligent being will discover my hoard and try to envision the type of world I came from. Imagine a distant star child like myself holding a coin of Earth encrusted with Martian soil. This is the first Roman coin I have ever seen (selected it because of what your research uncovered), and I am looking forward to seeing it and touching this piece of history. Mr. Les Dawson, an ancient coin expert, helped me to identify the obscure image of Victory on the coin's reverse. Mr. Dawson was so impressed with my enthusiasm that he also donated several ancient coins to me to have more adventures with! I was not sure how to thank this stranger that I never met, so I am researching and writing articles about some of the coins he gave me. I particularly enjoy ancient coins of multi-ethnic flavor with interesting tales to tell since I have a multi-ethinic background myself. My favorite Dawson coin is the fine URBS Roma bronze specimen from the period of Constantine the Great's commemorative tributes to the old and new Roman capitols of Rome and Constantinople from 330-346 A.D. 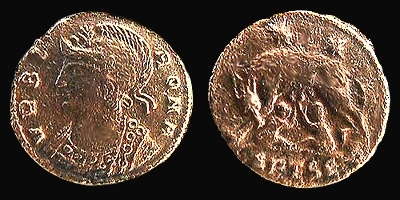 This particular coin not only illustrates the mythical origins of Rome but also has both Latin and Greek letters inscribed on the exergue (bottom) of the coin's reverse. 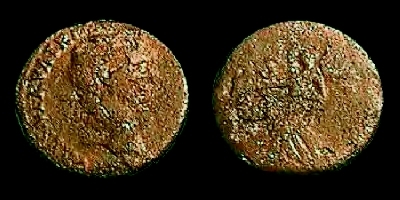 The exergue reads: SP TS E. The first two letters of the exergue SP alludes that the coin is a sacred commemorative coin. The next two letters TS signify the mint in Thessalonica, Greece. The last letter is not actually an E but the Greek symbol epsilon or number 5. The five letters proclaim that the coin is a sacred commemorative minted in Thessalonica, Greece at workshop 5 according to the Zander Klawan's brief chapter on Roman mint marks in his ANCIENT GREEK & ROMAN COINS book. The mythical Wolf Mother origin of this Roman commemorative is very much like the U.S. commemorative honoring the legendary, trail blazing native American mother Sacajawea. Stay tuned for more on the Romulus and Remus Wolf Mother commemorative in an upcoming full article along with other articles of legendary beginnings such as Aesop's Fabled Origins and Cultural ConFUSION in Bactria.